Ogunquit (/oʊˈɡʌŋkwɪt/ oh-GUN-kwit) is a town in York County, Maine, United States. As of the 2010 census its population was 892. The summer resort's name means "beautiful place by the sea". 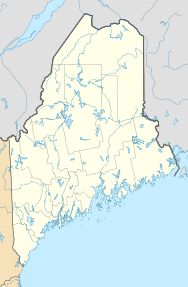 Ogunquit is part of the Portland–South Portland–Biddeford, Maine Metropolitan Statistical Area. Ogunquit, which means "beautiful place by the sea" in the indigenous Abenaki language, was first a village within Wells, which was settled in 1641. The first sawmill was established in 1686, and shipbuilding developed along the tidal Ogunquit River. Local shipwrights built schooners, brigs and dories. At what was then called Fish Cove, near the unnavigable Josias River, fishing was a major livelihood. But the cove was unprotected by a headland or breakwater from Atlantic storms, so fishermen had to protect their boats by hauling them ashore each night. Resolving to create a safe anchorage, they formed the Fish Cove Harbor Association, and dug a channel across land they purchased to connect Fish Cove with the Josias River. When the trench was complete, erosion helped to further widen the passage. The resulting tidewater basin is called Perkins Cove, spanned by a manually operated draw footbridge. With a 3½-mile beach of pale sand and dunes forming a barrier peninsula, connected to the mainland in 1888 by bridge across the Ogunquit River, the village was discovered by artists. It became a popular art colony and tourist area. Particularly after 1898, when the Ogunquit Art Colony was established, it was not unusual to see both artists and fishermen working around Perkins Cove. To accommodate summer crowds, several seaside hotels and inns were built. Marginal Way, a scenic trail, runs along the coast from Perkins Cove to Ogunquit Beach. Ogunquit separated from Wells in 1980 and receives visitors from as far as Australia. Part of Stephen King's The Stand, published in 1978, is set in Ogunquit. Ogunquit was named America's Best Coastal Small Town in USA Today's 10 Best Readers' Choice 2016. Ogunquit has become a destination for LGBT tourists, with numerous LGBT-owned and -operated hotels, restaurants, bars, theaters, and other businesses. Most of the LGBT-oriented businesses are in the village area of the town. A July 2016 article in Bloomberg cited Ogunquit as one of several Maine coastal destinations being visited by trendsetters and gentrifiers. Major airlines' flights to Portland make Ogunquit as convenient as the Hamptons for New Yorkers. The Wells-Ogunquit Community School District provides education for students of all ages in the coastal southern Maine towns of Wells and Ogunquit. According to the United States Census Bureau, the town has a total area of 15.25 square miles (39.50 km2), of which 4.18 square miles (10.83 km2) is land and 11.07 square miles (28.67 km2) is water. Ogunquit is drained by the Josias and Ogunquit Rivers. The highest elevation in town is just over 160 feet (49 m) above sea level, in several locations. The lowest elevation is sea level, along the Atlantic Ocean coastline. Acidic, stony-loam or sandy-loam glacial till soils of the Lyman series underlie most of Ogunquit. There also are outwash sands of the Adams or Croghan series. All of these soils have classic podzol profile development in undisturbed areas. Ogunquit’s Marginal Way, a 1.25-mile (2 km) trail with views of the coast, is neatly paved, and the treacherous cliffs are, in places, fenced. The path leads from the downtown shopping area to the fishing village in Perkins Cove, now an outdoor mall with jewelry, clothing, and candle boutiques. Ogunquit River at high tide in August 2006. Ogunquit River at low tide the same month. Ogunquit's beach nearly disappears at high tide. The Ogunquit River exits the Rachel Carson Preserve on the left and flows into colder waters of the Gulf of Maine. This climatic region is typified by large seasonal temperature differences, with warm to hot (and often humid) summers and cold (sometimes severely cold) winters. According to the Köppen Climate Classification system, Ogunquit has a humid continental climate, abbreviated "Dfb" on climate maps. As of 2000 the median income for a household in the town was $47,727, and the median income for a family was $56,731. Males had a median income of $44,583 versus $31,528 for females. The per capita income for the town was $34,289. About 1.2% of families and 4.2% of the population were below the poverty line, including 4.6% of those under age 18 and 3.7% of those age 65 or over. As of the census of 2010, there were 892 people, 498 households, and 234 families residing in the town. The population density was 213.4 inhabitants per square mile (82.4/km2). There were 2,009 housing units at an average density of 480.6 per square mile (185.6/km2). The racial makeup of the town was 97.0% White, 0.1% African American, 0.1% Native American, 1.0% Asian, 0.4% from other races, and 1.3% from two or more races. Hispanic or Latino of any race were 1.5% of the population. There were 498 households of which 8.6% had children under the age of 18 living with them, 42.0% were married couples living together, 4.0% had a female householder with no husband present, 1.0% had a male householder with no wife present, and 53.0% were non-families. Of all households, 41.2% were made up of individuals and 20.9% had someone living alone who was 65 years of age or older. The average household size was 1.79 and the average family size was 2.37. The median age in the town was 61.7 years. Of the residents, 7.6% were under the age of 18; 2.5% were between the ages of 18 and 24; 13.6% were from 25 to 44; 34% were from 45 to 64; and 42.4% were 65 years of age or older. The gender makeup of the town was 50.1% male and 49.9% female. ^ a b "US Gazetteer files 2010". United States Census Bureau. Retrieved December 16, 2012. ^ a b "American FactFinder". United States Census Bureau. Retrieved December 16, 2012. ^ "Population Estimates". United States Census Bureau. Archived from the original on June 17, 2013. Retrieved July 6, 2013. ^ "Marginal Way". Retrieved March 22, 2008. ^ "Best Coastal Small Town Winners: 2016 10Best Readers' Choice Travel Awards". ^ a b "Gay Ogunquit: Lodging, Travel and Nightlife in Ogunquit, Maine". Retrieved April 5, 2017. ^ Ekstein, Nikki. "Forget Montauk: Why Maine Should Be Your Modern Summer Retreat". ^ "404 – Error: 404". ^ "Ogunquit, Maine Köppen Climate Classification (Weatherbase)". Wikimedia Commons has media related to Ogunquit, Maine. Wikivoyage has a travel guide for Ogunquit.